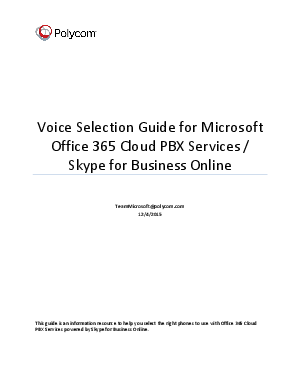 With new Skype for Business services for Office 365 customers; Skype Meeting Broadcast (worldwide), PSTN Conferencing (US at this time), and Cloud PBX with PSTN Calling (US at this time) — cloud communications services with Skype for Business Online are gaining visibility and are now being deployed. Customers can realize substantial savings by eliminating expensive external conference services. Customers can also reduce CAPEX investments and time spent maintaining / upgrading on premise equipment—like an aging PBX or IP PBX.